Department of Ichthyology and Aquatic Environment, School of Agricultural Sciences, University of Thessaly, Fytoko Street, 38 445, Nea Ionia Magnesia, Greece. Fish bones mainly consist of calcium-phosphor hydroxyapatite salts (inorganic part, about 65% of bone’s dry mass) embedded in a matrix of type I collagen fibers (organic part) (Mahamid et al., 2008). Collagen represents more than 90% of the organic bone matrix and confers resistance to the structure and establishes the biomechanical properties of the tissue (Moro et al., 2000). The relationship between collagen and hydroxyapatite is crucial for bone toughness and stiffness. The collagen fibril diameter has been regarded as the most important factor related to biomechanical strength of tissues (Ottani et al., 1998). Regarding the bone mineral content, it is generally accepted that its measurement is an appropriate estimate of bone strength. The main constitutes of fish vertebra include calcium, phosphate and carbonate with small amounts of magnesium, sodium, strontium, lead, citrate, fluoride, hydroxide and sulfate (Lall, 2002). Skeletal deformities is a major factor that affects the production cost, the external morphology of the fish as well as its survival and growth. These deformities downgrade hatcheries' production, even in the case of well-studied species (Dicentrarchus labrax and Sparus aurata). Deformities are a complex mixture of different bone disorders including vertebral and spinal malformations such as kyphosis, lordosis, scoliosis, platyspondyly and vertebrae fusion. Other deformities include neck-bend, compressed snout, bent jaw, harelip or front and downwards protuberance of jaw; reduction of lower jaw, short operculum, reduced or asymmetric fins, etc. In marine hatcheries skeletal deformities can affect 7–20% on average of the produced juveniles, whereas occasionally this incidence has been shown to elevate at 45–100% (Georgakopoulou et al., 2010). The development of the skeletal deformities is not well understood and related with nutritional, environmental and genetic factors (Fernadez et al. 2008). They are induced during the embryonic and post-embryonic periods of life. Many researchers have proposed a variety of abiotic and nutritional factors (Takeuchi et al., 1998; Kihara et al., 2002; Haga et al., 2003; Sfakianakis et al., 2006; Cobcroft and Battaglene, 2009; Georgakopoulou et al. 2010) as significant in the development of skeletal deformities. Generally it is accepted that skeletal deformities can be environmentally induced in two ways: a) by neuromuscular effects, which can lead to vertebral column deformities without changing its chemical composition and b) by altering the necessary biological processes for maintaining the biochemical integrity of bone (Divanach et al., 1996). This review aims to highlight the main of these factors. In addition to calcium deficiency, which is not common in fishes, phosphorus deficiency can lead to skeletal abnormalities. Ogino and Takeda (1976) reported cephalic deformities in the frontal bones of the common carp fed low phoshorus diets. Signs of P deficiency were observed in haddock juveniles (Melanogrammus aeglefinus) fed a diet at a level of 0.42% P (Roy and Lall, 2003). Gross examination showed curvature of vertebrae, particularly near the caudal region. Bone deformities were apparent in the spine and the lower part of the vertebrae. According to the same authors excess P not only causes excessive excretion of this element but it also has a negative effect on bone mineralization. Similar bone deformities have been also reported in salmon (Watanabe et al., 1980), carp and rainbow trout (Ogino and Takeda, 1976, 1978; Ogino et al., 1979) fed low phoshorus diets. In rapidly growing post-smolt Atlantic salmon the phosphorus deficiency, leads fishes to develop soft bones and skeletal deformities (Baeverfjord et al., 1998). Dietary factors and certain nutrients play a very important role to the formation of the skeletal abnormalities. The gross findings of kyphosis, scoliosis, and lordosis are consistent with dietary vitamin C deficiency. According to Madsen and Dalsgaard (1999) farmed rainbow trout (Oncorhynchus mykiss) can develop more severe skeletal abnormalities to the cranial, medial, and caudal part of the vertebral column when they fed with a diet with a low vitamin C concentration. A significant period of time, 15 or 20 weeks, is the most times required for the signs of vitamin C deficiency to become present (Sato et al., 1982). Lordosis is a common deformity in the mid-hemal region of the vertebral column in scorbutic rainbow trout and Japanese flounder (Madsen and Dalsgaard, 1999; Wang et al., 2002) while the pearl cichlid forms lordosis to the caudal region. (Wimberger, 1993). In a study of vitamin C deficiency in channel catfish (Ictalurus punctatus), the findings included spinal kyphosis, scoliosis and lordosis (Lim and Lowell, 1978). Nutritional vitamin A imbalance implied the appearance of vertebral deformities. Vitamin A overdose might induce vertebral deformities in gilthead sea bream juveniles through an advanced bone mineralization, their consequent higher mechanical load at vertebral end-plates and its down-stream bone remodelling process (Fernández et al., 2012). Hypervitaminosis A accelerates the development of the vertebral column through precocious mineralization (Vasan and Lash, 1975) and may cause skeletal deformities like vertebral curvatures (Hilton, 1983; Dedi et al., 1997), vertebral compression (Dedi et al., 1997; Takeuchi et al., 1998), vertebral fusion (Dedi et al., 1997; Takeuchi et al., 1995) and jaw deformities (Haga et al., 2003). According to Fernández et al (2008) gilthead sea bream larvae are very sensitive to dietary levels of vitamin A. Higher levels of dietary vitamin A than those included in a commercial emulsion for rotifer enrichment led to different levels and typologies of skeletal deformities. Vitamin K has been known to regulate bone formation through osteocalcin synthesis by osteoblasts, which is important for mineralization and bone structure. According to Roy and Lall (2007) vitamin K deficiency in haddock (Melanogrammus aeglefinus L) is responsible for decreased bone mineralization, decreased bone mass and can enhances bone deformities. Udagawa (2001) reported that in mummichog Fundulus heteroclitus abnormalities such as vertebral fusion, vertebral deformity and vertebral row irregularity were significantly higher in fish fed a vitamin K-free diet. Lordosis has been correlated with the absence of a functional swimbladder. Chatain (1982) proposed that juvenile red sea breams without a functional swimbladder have difficulties to stay at the surface or in the water column because of the negative buoyancy. An aberrant swimming behavior with a slanted, nervous and jerky movement is adopted by these fishes, resulting a gradually deforming axial skeleton. Tesseyre (1979) reported a correlation of nonfunctional swimbladder and lordosis in Dicentrarchus labrax. A correlation between the appearance of lordosis in 0.7-4 g juvenile Dicentrarchus labrax and Sparus aurata and the lack of functional swimbladders was found in larval forms of both species (Chatain, 1994). Spinal curvatures were mainly in the area of vertebrae 14-15, the area where muscle pressure is highest during swimming. Late swimbladder inflation did not reduce spinal curvatures in fish with chronic lordosis starting at the larval phase (Chatain, 1994) (Figure 1). Figure 1: A. X-ray of Sparus aurata with skeletal deformities. Lordosis and vertebral compression are two of the main deformities of the vertebral column and sometimes coexist. B. Sparus aurata without skeletal deformities. In both cases there is a functional swimbladder. (Berillis unpublished). Many chemicals are known to induce neuromuscular damages and result in skeletal deformities. Lead (Pb) is one of the most toxic elements found in many industrial effluents. It can cause skeletal deformities by impairing developmental processes and bone formation. According to Davies et al. (1976) chronic exposure to Pb produce scoliosis and caudal atrophy to the rainbow trout. Nile tilapias after 30 days of exposure to Pbacetate toxicity (146.8 mg/L) developed slight dorsal spinal curvature with widening of the intervertebral space (Hassanain et al, 2012). Holcombe et al. (1976) observed scoliosis in newly hatched Salvelinus fontinalis larvae after incubation in Pb solutions. The percentage of deformed larvae was related with the Pb concentration reaching respectively 21% and 58% at 235 and 473 μg dm−3 of Pb. In the control only 1% of larvae developed scoliosis. Newsome and Piron (1982) pointed a relationship between the Pb content of the diet and the incidence of skeletal deformities in the Zebra Danio (Brachydanio rerio). Malformations caused by cadmium (Cd), have been described in relation to vertebral anomalies in fishes (Fujimagari et al., 1975; Muramoto, 1979). When Cyprinus carpio exposed to Cd the Ca/P ratio in the deformed fish was significantly lower in the vertebrae: 1.71 as compared with 2.05 in the control (Muramoto, 1981). Prolonged exposure to Cd induces abnormal bone metabolism, loss of calcium, bone weakening, cavitation, shortening and assimilation of cartilage. The spinal column is used as a fulcrum and the action of the caudal musculature leads to vertebral curvature (Muramoto, 1981). Exposure to toxic concentrations of zinc (Zn) can lead to vertebral fractures and to the development of internal hemorrhage in minnow Phoxinus phoxinus (Bengtsson, 1974). Somasundaram et al. (1984) reported that Clupea harengus larvae from the eggs incubated in 6.0 and 12.0 mg dm−3 of Zn were significantly shorter than the controls and had malformation in the eye, the otic capsules, and deformities of the jaw and branchial arches. In mercury (Hg) contaminated water Oryzias latipes larvae developed C-shaped tails (curved downwards) and were unable to move the caudal fins (Heisinger and Green, 1975). Devlin (2006) reported that exposure of fathead minnow hatchlings to Hg resulted in spinal flexures. Jaw underdevelopment, spinal and cranial malformations were developed in Cyprinus carpio larvae after exposure during embryonic development to copper (Cu) at pH 6.3 (Stouthart et al., 1996), while Sarnowski (1998) observed spinal malformations, head enlargement and edema in Ctenopharyngodon idella larvae after exposure to Cu during embryonic life. Phoxinus phoxinus (Bengtsson, 1974). Somasundaram et al. (1984) reported that Clupea harengus larvae from the eggs incubated in 6.0 and 12.0 mg dm−3 of Zn were significantly shorter than the controls and had malformation in the eye, the otic capsules, and deformities of the jaw and branchial arches. In mercury (Hg) contaminated water Oryzias latipes larvae developed C-shaped tails (curved downwards) and were unable to move the caudal fins (Heisinger and Green, 1975). Devlin (2006) reported that exposure of fathead minnow hatchlings to Hg resulted in spinal flexures. Jaw underdevelopment, spinal and cranial malformations were developed in Cyprinus carpio larvae after exposure during embryonic development to copper (Cu) at pH 6.3 (Stouthart et al., 1996), while Sarnowski (1998) observed spinal malformations, head enlargement and edema in Ctenopharyngodon idella larvae after exposure to Cu during embryonic life. The water temperature seems to be another factor that can lead to the formation of skeletal deformities. Georgakopoulou et al. (2010) showed that in Sparus aurata there is a significant effect of water temperature on the development of inside folded gill-cover (when 16 °C water temperature was applied during the autotrophic and exotrophic larval periods), haemal lordosis (fluctuating response against water temperature), as well as of mild deformities of the caudal (was elevated when 16 °C temperature was applied during the exotrophic larval period) and dorsal fin (were favoured when 22 °C temperature was applied during the autotrophic and exotrophic phases). Sfakianakis et al. (2006) tested the effect of water-temperature (15 or 20 °C) during the larval phase on sea bass sensitivity to current-induced lordosis. At the end of the pregrowing phase, lordosis was more frequent in fish that developed at 20 °C. There is also a correlation between ascorbic aciddeficient diets and water temperature. Sato (1983) showed that after 20 weeks in ascorbic deficient rainbow trout, the deformity in the deficient groups maintained at 16°C, 20°C, and 16 to 20°C was 10, 28, and 57 percent, respectively. The role of the currents on the appearance of skeletal malformations is very strong. Divanach (1997) showed that when sea basses reared without current there was no externally visible malformation, and only 7% could be characterised as very slightly or slightly deformed through radiography. In contrast the population reared with high current, 47% of the individuala showed some slight or very slight deformation through radiography, and 20% were so heavily deformed that the externally visible anomaly made them unmarketable. Carps Cyprinus carpio reared in strong-water stream showed a lordosis deformation (Backiel et al., 1984). Juvenile red sea breams, Pagrus major, developed lordosis (21–25%) when they swam at in water with current velocity of 10 cm s−1. Fish exposed to 5 cm s−1 current velocity did not exhibit a cuneiform centrum (Kihara, 2002). Schilling et al. (1996) working on Danio rerio described the phenotypes of arch mutants. They isolated 109 mutations that disrupt pharyngeal arch development in the zebrafish. Among them, 59 most severely affect the posterior arches, including the hyoid and five branchial segments that support the gills. According to Piotrowski et al. (1996) mutations in five genes (sucker, schmerle, hoover, sturgeon, gaping mouth) of Danio rerio cause reductions in the anterior arch elements but leave posterior ones mostly unaffected. In contrast to the ‘hammerheadlike’ mutants, the morphology of the chondrocytes appears normal, which suggests that differentiation is not affected. Fisher et al. (2003) isolated chihuahua, a dominant mutation causing a general defect in bone growth. Mapping and molecular characterization of the chihuahua mutation indicated that the defect resides in the gene encoding the collagen I(α1) chain. The characterization of the chi molecular defect confirms the similarity of the collagen assembly process and the importance of type I collagen in bone formation in zebrafish. In gilthead Sparus aurata a consecutive repetition of lordosis, scoliosis and kyphosis (LSK) from the head to the caudal fin was described and statistically associated with the family structure (Afonso, 2000). A possible role of the bacterium Flavobacterium psychrophilum to the formation of vertebral column deformities (cranial, medial, and caudal part of the vertebral column) has been reported by Madsen and Dalsgaard (1998). Kent et al. (2004) associated the high prevalence of vertebral deformities seen in fishes from the Willamette River near Portland, Oregon with parasites. More than 90% of the deformities seen in chiselmouths (Acrocheilus alutaceus) can be attributed to metacercariae (probably A. donicus). Combining observations from histology and cleared fish, proved that Myxobolus sp. and metacercariae were equally responsible for the deformities seen in northern pikeminnow (Ptychocheilus oregonensisare). In Leuciscus cephalus lordosis and compression of the caudal region associated with destruction of cartilagenous tissue by masses of Myxobolus ellipsoides spores (Bucke and Andrews, 1985) (Figure 2). Figure 2: A. X-ray of Sparus aurata with skeletal deformity of scoliosis. B. Sparus aurata with kyphosis. In both cases lordosis is also present indicated that fishes can have more than one vertebral deformity (Berillis unpublished). According to Cobcroft et al. (2008) there is a positive correlation between walling behaviour (which was induced by tank colour) and jaw malformation in larval striped trumpeter Latris lineata. The highest proportion of severely malformed jaws at 44 days post-hatching occurred in red tanks, followed by green, white, blue, black and marble. Vertebra damage may also result from electrical shock of the electrofishing. Adult rainbow trout Salmo gairdneri captured by electrofishing were analyzed by Sharber and Carothers (1988) for spinal injury. Of the 209 captured fishes, 50% of them suffered spinal injuries involving an average of eight vertebrae that were dislocated, splintered, or both. One-quarter-sine wave pulses injured the 67 % of fishes and exponential pulses or square wave pulses the 44% of them. Quarter-sine waves also damaged significantly more vertebrae per fish. Low dissolved oxygen and radiation are factors that can also lead to skeletal deformities (Bengtsson et al., 1895). Skeletal deformities is an important factor that downgrade hatcheries’ production and have a high economic affect to the producers. Fishes with skeletal deformities live less than the normal ones and are not preferred by the consumers. Deformities are a complex mixture of different bone disorders and are not well understood. Nutritional factors such as phosphorus deficiency, vitamin C deficiency, vitamin K deficiency and hypervitaminosis A can lead to twisted neural and hemal spines, development of soft bones, decreased bone mass, vertebral fusion, lordosis, kyphosis and scoliosis. Environmental factors are also important. Current velocity, water temperature and heavy metal pollution are some of them resulting, among other malformations, reduction of the vertebrae Ca/P ratio, shortening and assimilation of cartilage, eye and otic capsules malformations, head enlargement and bone weakening. Lack of functional swimbladder, gene mutations, bacteria and parasites infections, electrofishing, low dissolved oxygen, radiation and walling behavior induced by the color of the tanks are referred to the literature as possible factors that can lead to skeletal deformities. Afonso, J.M., Montero, D., Robaina, L., Astorga, N., Izquierdo, M.S., Gines, R., (2000). Association of a lordosis-scoliosis-kyphosis deformity in gilthead seabream (Sparusaurata) with family structure, Fish Physiology and Biochemistry, 22(2): 159-163. Baeverfjord, G., Asgard, T., Shearer, K.D., (1998). Development and detection of phosphorus deficiency in Atlantic salmon, Salmosalar L., parr and post-smolts, Aquaculture Nutrition, 4: 1–11.doi:10.1046/j.1365-2095.1998.00095.x. Bengtsson, B.E., (1974). Vertebral damage to minnow Phoxinusphoxmus exposed to zinc, Oikos, 25: 134-9.doi:10.2307/3543634. Bengtsson, B.E., Bengtsson, Å.,Himberg, M., (1985). Fish deformities and pollution in some Swedish waters, Ambio, 32-35. Bucke, D., Andrews, C., (1985). Vertebral abnormalities in chub, Leuciscus(Squalius) cephalus L, Bulletin of the European Association of Fish Pathologists, 5(1), 3-5. Chatain, B., (1982). Contribution al’etude de l’blevagelarvaire de la doradejaponaise (Chrysophrys major), PhD Thesis, Universited’Aix-Marseille II. Chatain, B., (1994). 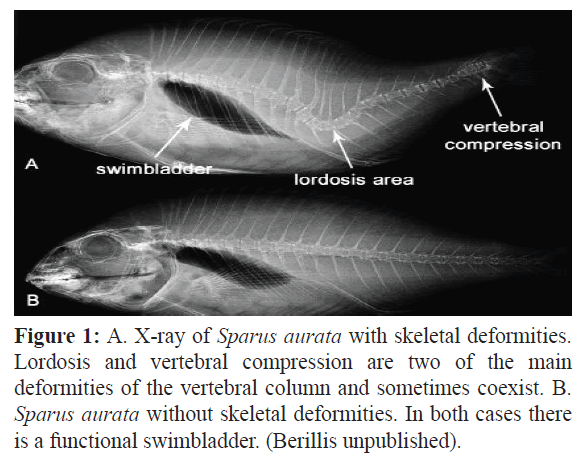 Abnormal swimbladder development and lordosis in sea bass (Dicentrarchuslabrax) and sea bream (Sparusauratus). Aquaculture, 119(4), 371-379.doi:10.1016/0044-8486(94)90301-8. Cobcroft, J.M., Battaglene, S.C., (2009). Jaw malformation in striped trumpeter Latrislineata larvae linked to walling behaviour and tank colour, Aquaculture, 289(3): 274-282.doi:10.1016/j.aquaculture.2008.12.018. Dedi, J., Takeuchi, T., Seikai, T., Watanabe, T., Hosoya, K., (1997). Hypervitaminosis A during vertebral morphogenesis in larval Japanese flounder, Fisheries Science, 63: 466–473. Davies, P.H., Goettl Jr., J.P., Sinley, J.R.,Smith, N.F., (1976). Acute and chronic toxicity of lead to rainbow trout Salmogairdneri in hard and soft water, Water Research, 10(3): 199-206.doi:10.1016/0043-1354(76)90128-7. Devlin, E.W., (2006). Acute toxicity, uptake and histopathology of aqueous methyl mercury to fathead minnow embryos, Ecotoxicology, 15: 97–110.doi:10.1007/s10646-005-0051-3. Divanach, P., Boglione, C., Menu, B., Koumoundouros, G., Kentouri, M., Cataudella, S., (1996). Abnormalities in finfish mariculture: an overview of the problem, causes and solutions. In: Chatain, B., Saroglia, M., Sweetman, J., Lavens, P. (eds. ), Seabass and Seabream Culture: Problems and Prospects. EAS International Workshop, Verona, Italy, pp. 45–66. Divanach, P., Papandroulakis, N., Anastasiadis, P., Koumoundouros, G., Kentouri, M., (1997). Effect of water currents on the development of skeletal deformities in sea bass (Dicentrarchuslabrax L.) with functional swimbladder during postlarval and nursery phase, Aquaculture, 156(1): 145-155.doi:10.1016/S0044-8486(97)00072-0. Fernández, I., Hontoria, F., Ortiz-Delgado, J.B., Kotzamanis, Y., Estévez, A., Zambonino-Infante, J.L., Gisbert, E., (2008). Larval performance and skeletal deformities in farmed gilthead sea bream (Sparusaurata) fed with graded levels of Vitamin A enriched rotifers (Brachionusplicatilis), Aquaculture, 283(1): 102-115.doi:10.1016/j.aquaculture.2008.06.037. Fernández, I., Ortiz-Delgado, J.B., Sarasquete, C., Gisbert, E., (2012). Vitamin A effects on vertebral bone tissue homeostasis in gilthead sea bream (Sparusaurata) juveniles, Journal of Applied Ichthyology, 28(3): 419-426.doi:10.1111/j.1439-0426.2012.01997.x. Fisher, S., Jagadeeswaran, P., Halpern, M.E., (2003). Radiographic analysis of zebrafish skeletal defects, Developmental biology, 264(1): 64-76.doi:10.1016/S0012-1606(03)00399-3. Georgakopoulou, E., Katharios, P., Divanach, P., Koumoundouros, G., (2010). Effect of temperature on the development of skeletal deformities in Gilthead seabream (Sparusaurata Linnaeus, 1758), Aquaculture, 308(1): 13-19.doi:10.1016/j.aquaculture.2010.08.006. Heisinger, J.F., Green, W., (1975). Mercuric chloride uptake by eggs of the ricefish and resulting teratogenic effects, Bulletin of Environmental Contamination and Toxicology, 14: 665–673.doi:10.1007/BF01685240. Hilton, J.W., (1983). Hypervitaminosis A in rainbow trout (Salmogairdneri) toxicity signs and maximum tolerable level, The Journal of Nutrition, 113: 1737–1747. Holcombe, G.W., Benoit, D.A., Leonard, E.N., McKim, J.M., (1976). Long-term effects of lead exposure on three generations of brook trout (Salvelinus fontinalis), Journal of the Fisheries Board of Canada, 33:1731–1741.doi: 10.1139/f76-220. Kent, M.L., Watral, V.G., Whipps, C.M., Cunningham, M.E., Criscione, C.D., Heidel, J.R., Curtis, L.R., Spitsbergen, J., Markle, D.F., (2004). A digeneanmetacercaria (Apophallus sp.) and a myxozoan (Myxobolus sp.) associated with vertebral deformities in cyprinid fishes from the Willamette River, Oregon, Journal of Aquatic Animal Health, 16(3): 116-129.doi:10.1577/H04-004.1. Kihara, M., Ogata, S., Kawano, N., Kubota, I., Yamaguchi, R., (2002).Lordosis induction in juvenile red sea bream, Pagrus major, by high swimming activity, Aquaculture, 212: 149–158.doi:10.1016/S0044-8486(01)00871-7. Lall, S.P., (2002). The minerals.In Halver, J.E., Hardy, R.W. (Eds), Fish Nutrition. Academic Press Inc., San Diego, 3rd edition, pp. 259–308.doi:10.1016/B978-012319652-1/50006-9. Lim, C., Lowell, R.T., (1978). Pathology of the vitamin C syndrome in channel catfish (Ictaluruspunctatus), The Journal of Nutrition, 108:1137–1146. Madsen, L., Dalsgaard, I., (1999). Vertebral column deformities in farmed rainbow trout (Oncorhynchusmykiss), Aquaculture, 171(1): 41-48.doi:10.1016/S0044-8486(98)00427-X. Mahamid, J., Sharir, A., Addadi, L., Weiner, S., (2008). Amorphous calcium phosphate is a major component of the forming fin bones of zebrafish: indications for an amorphous precursor phase, Proceedings of the National Academy of Sciences, 105(35): 12748-12753.doi: 10.1073/pnas.0803354105. Moro, L., Romanello, M., Favia, A., Lamanna, M.P., Lozupone, E., (2000). Posttranslational modifications of bone collagen type I are related to the function of rat femoral regions, Calcified Tissue International, 66: 151–156.doi: 10.1007/s002230010030. Muramoto, S., (1981). Vertebral column damage and decrease of calcium concentration in fish exposed experimentally to cadmium, Environmental Pollution Series A, Ecological and Biological, 24(2): 125-133.doi:10.1016/0143-1471(81)90074-X. Newsome, C.S., Piron, R.D., (1982). Aetiology of skeletal deformities in the Zebra Danio fish (Bruchydaniorerio, Hamilton-Buchanan), Journal of Fish Biology, 21(2): 231-237.doi: 10.1111/j.1095-8649.1982.tb04003.x. Ogino, C., Takeda, H., (1976). Mineral requirements in fish. III. Calcium and phosphorus requirements in carp, Bulletin of the Japanese Society of Scientific Fisheries, 42: 793–799.doi: 10.2331/suisan.42.793. Ogino, C., Takeda, H., (1978). Requirements of rainbow trout for dietary calcium and phosphorus, Bulletin of the Japanese Society of Scientific Fisheries, 44: 1019–1022. Ogino, C., Takeuchi, L., Takeda, H., Watanabe, T., (1979).Availability of dietary phosphorus in carp and rainbow trout, Bulletin of the Japanese Society of Scientific Fisheries, 45: 1527–1532. Ottani, V., Franchi, M., De Pasquale, V., Leonardi, L., Morocutti, M., and Ruggeri, A., (1998).Collagen fibril arrangement and size distribution in monkey oral mucosa, Journal of Anatomy, 192: 321–328.doi: 10.1046/j.1469-7580.1998.19230321.x. Piotrowski, T., Schilling, T.F., Brand, M., Jiang, Y.J., Heisenberg, C.P., Beuchle, D.,Grandel, H., van Eeden, F.J., Furutani-Seiki, M., Granato, M., Haffter, P.,Hammerschmidt, M., Kane, D.A., Kelsh, R.N., Mullins, M.C., Odenthal, J.,Warga, R.M., Nusslein-Volhard, C., (1996). Jaw and branchial arch mutants in zebrafish II: anterior arches and cartilage differentiation, Development, 123(1): 345-356. Roy, P.K., Lall, S.P., (2003). Dietary phosphorus requirement of juvenile haddock (Melanogrammusaeglefinus L.), Aquaculture, 221: 451–468.doi:10.1016/S0044-8486(03)00065-6. Roy, P.K., Lall, S.P., (2007). Vitamin K deficiency inhibits mineralization and enhances deformity in vertebrae of haddock (Melanogrammusaeglefinus L.). Comparative Biochemistry and Physiology Part B: Biochemistry and Molecular Biology, 148(2): 174-183.doi:10.1016/j.cbpb.2007.05.006. Sarnowski, P., (1998). The effect of copper on grass carp larvae.2nd international conference Trace Elements: Effects of organisms and environment, Katowice, pp. 181–185. Sato, M., Kondo, T., Yoshinaka, R., Ikeda, S., (1982).Effect of dietary ascorbic acid levels on collagen formation in rainbow trout, Bulletin of the Japanese Society of Scientific Fisheries, 48: 553–556. Sato, M., Kondo, T., Yoshinaka, R., Ikeda, S., (1983).Effect of water temperature on the skeletal deformity in ascorbic acid-deficient rainbow trout, Bulletin of the Japanese Society of Scientific Fisheries, 49: 443-446.doi: 10.2331/suisan.49.443. Schilling, T.F., Piotrowski, T., Grandel, H., Brand, M., Heisenberg, C.P., Jiang, Y.J.,Beuchle, D., Hammerschmidt, M., Kane, D.A., Mullins, M.C., van Eeden, F.J.,Kelsh, R.N.,Furutani-Seiki, M., Granato, M., Haffter, P.,Odenthal, J.,Warga, R.M., Trowe, T., Nusslein-Volhard, C., (1996). Jaw and branchial arch mutants in zebrafish I: branchial arches, Development, 123(1): 329-344. Sfakianakis, D.G., Georgakopoulou, E., Papadakis, I.E., Divanach, P., Kentouri, M., Koumoundouros, G., (2006). Environmental determinants of haemallordosis in European sea bass, Dicentrarchuslabrax (Linnaeus, 1758), Aquaculture, 254(1): 54-64.doi:10.1016/j.aquaculture.2005.10.028. Sharber, N.G., Carothers, S.W., (1988). Influence of electrofishing pulse shape on spinal injuries in adult rainbow trout, North American Journal of Fisheries Management, 8(1): 117-122.doi:10.1577/1548-8675(1988)008<0117:IOEPSO>2.3.CO;2. Somasundaram, B., King, P.E., Shackley, S., (1984). The effects of zinc on postfertilization development in eggs of Clupea harengus L., Aquatic Toxicology, 5: 167–178. doi:10.1016/0166-445X(84)90007-9. Stouthart, X.J., Haans, J.L., Lock, R.A., Bonga, S.E.W., (1996). Effects of water pH on copper toxicity to early life stages of the common carp (Cyprinuscarpio), Environmental toxicology and Chemistry, 15(3): 376-383.doi:10.1016/0166-445X(94)00079-6. Takeuchi, T., Dedi, J., Ebisawa, C., Watanabe, T., Seikai, T., Hosoya, K., Nakazoe, J.I., (1995). The effect of β-carotene and vitamin A enriched Artemianauplii on the malformation and color abnormality of larval Japanese flounder, Fisheries Science, 61: 141–148. Tesseyre, C., (1979). Etude des conditions d’elevageintensif du loup (Dicentrarchuslabrax L.). PhD Thesis, Universite de Montpellier. Wang, X., Kim, K., Bai, S.C., (2002). Effects of different dietary levels of L-ascorbyl-2-polyphosphate on growth and tissue vitamin C concentrations in juvenile olive flounder, Paralichthysolivaceus (Temminck et Schlegel), Aquaculture research, 33: 261–267.doi: 10.1046/j.1355-557x.2002.00669.x. Wimberger, R.H., (1993). Effects of vitamin C deficiency on body shape and skull osteology in Geophagusbrasiliensis: implications for interpretations of morphological plasticity, Copeia, 2: 343–351.doi: 10.2307/1447135.